Last year, while looking through Toni T. Seiler’s 1989 book of local historical photographs, “In Retrospect,” Greenville, Ohio, I came across a photo of Wiley Post’s Winnie Mae aircraft. 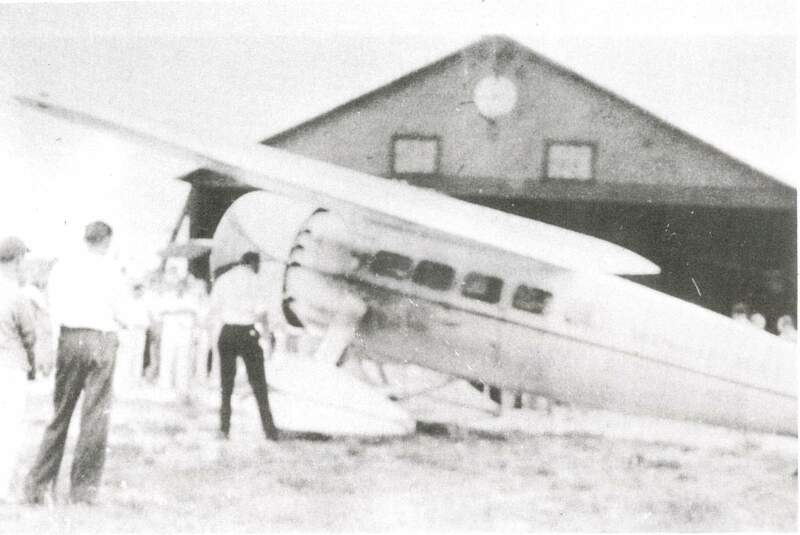 The caption below the photo said simply that Post had landed the plane at Greenville’s Lansdowne Airport in May 1934. No further information was given as to the cause or duration of the famed aviator’s visit to our town. Given Post’s popularity and achievements during the 1930s, I assumed it would be easy to track down more information about the event in our local newspaper archives and historical books. I was wrong. I looked through the archives for the local newspapers for every day of late April, May, and early June 1934 to no avail. Not a word was printed. Local history books were similarly silent. Garst Museum had no information. I contacted the genealogy departments at Dayton Metro Library and the Public Library of Cincinnati and Hamilton County, since Post spent much of 1934 in Dayton testing flight equipment and those institutions maintain Dayton newspaper archives. Nothing. Finally, I thought to look in a very unlikely place. I opened GPL’s copy of the 1934 Greenville High School Chief yearbook. The older editions of the yearbook often included photos and brief information about both local and world events during the school year, and I hoped something as momentous as one of the world’s hotshot aviators landing at our town’s unpaved airport might have warranted a mention. There was nothing printed in the Chief itself that year, but paper-clipped to a back page in our copy was a newspaper clipping about the event. The clipping didn’t show the date or even which newspaper it had been printed in, but it did provide a bit more information. Since I now knew a local (or at least regional) newspaper had definitely printed something about the event, I once again searched the newspaper archives. I decided to widen my date range to include all of June 1934, and eventually found what I was looking for: the piece I’d found clipped to the Chief was published in the Greenville Daily Advocate newspaper on June 21, 1934. The May date listed in Seiler’s book had been erroneous. Post was born in his family’s farmhouse in eastern Texas on November 22, 1898. After several years, the family moved to Oklahoma. Wiley didn’t care for his family’s farming lifestyle, and when he saw an airplane for the first time at the age of 15, he knew this machine would eventually take him aware from the life of hot, dirty field work he so hated. He left home at 19 and trained as an auto mechanic, though he never intended to make a career out of it–he wanted to know how engines worked so he could push them to their limit, not fix them. He joined a flying circus as a parachutist in 1924, and took his first solo flight as a pilot in 1926, the year he purchased his first plane with settlement money from the work accident that cost him his left eye. He eloped with his bride, Mae Laine, in 1927, and the couple hopped across the border from Texas to Oklahoma, a state with no waiting period to receive a marriage license. When mechanical issues forced the plane down in a field, the couple found the nearest preacher, got hitched, and spent the next few hours fixing the plane before taking off again. Post worked for a few years as an exhibition pilot and then a professional passenger pilot. Despite never attending a day of high school, Post was a successful commercial pilot by 1930. In the coming years, he would become famous various long-distance flights in his trusty Lockheed Vega Winnie Mae, including the his successful circumnavigation of the globe, which he accomplished with a navigator in 1931, setting a record for the feat. Not long later, he became the first pilot to ever circle the globe alone, without a navigator. After a couple years of exhibitions, Post began designing a pressurized suit for high altitude flight. He spent much of the summer of 1934 in Dayton, Ohio, at Wright Field, testing these plans. In an era before plane cockpits were pressurized, altitude was limited largely by the inability of the human body to handle high altitudes. An England-Australia air race coming up in autumn of that year prompted Post to develop a pressure suit that would allow his somewhat out-of-date Lockheed Vega to fly at higher altitudes–and therefore hopefully higher speeds–than his opponents, since he was aware of the benefits of the jet stream winds in the stratosphere. He spent the summer in Dayton testing prototypes, and he also had a new ADF radio, which would automatically detect the plane’s bearing when other means for doing this were ineffective, installed in the Winnie Mae by the Army. A report from Wright Field from the very date of the unplanned landing in Greenville first mentions Post’s plans to use oxygen with the pressure suit. Two days later, on June 23, Post tried the suit on the for first time in his Dayton hotel room. He reportedly wore it for the first time at the helm of the Winnie Mae in July, though without pressurizing the suit. He flew at altitude for the first time with the pressurized suit September 5, 1934, reaching 40,000 feet over Chicago. The earliest known photograph of Lansdowne Airport. Photo provided by Randy Hoying. According to the Daily Advocate clipping (three-quarters of which was taken up by a sketched illustration of Post’s eye-patched face over a map of some of his flights), Post was forced to land at Lansdowne Airport on June 21 unexpectedly after the Winnie Mae lost oil pressure. He was on a flight from Dayton, Ohio, to Chicago, Illinois, for the World’s Fair. He touched down in Greenville around 10 a.m., and though mechanics began working on the aircraft right away, they still had not finished by 2 p.m. when the paper went to press. John McEowen, Lansdowne Airport’s port manager, reportedly drove the pilot into Greenville to have lunch, though which of the town’s eateries hosted the famous flyer is not mentioned. The top image above is a 1994 aerial photograph of the remains of Lansdowne Airport. The outlines of the crossed runways are clearly visible. The bottom image is a 2014 aerial photo showing the same. 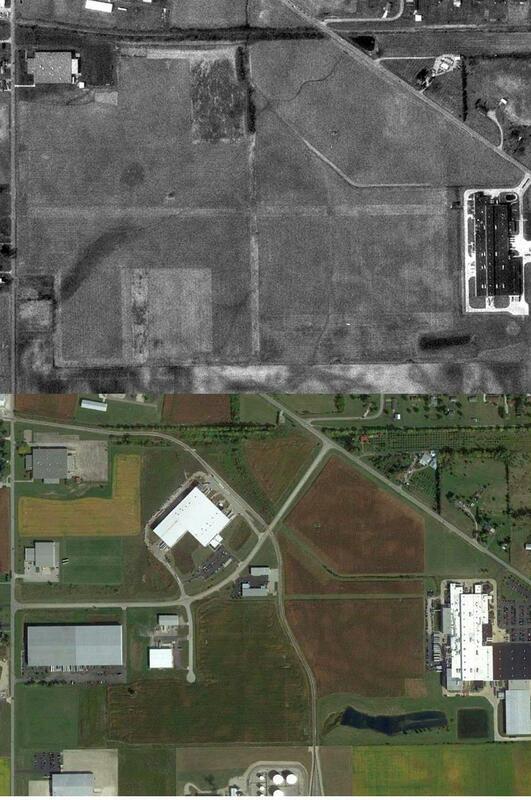 The outline of the east-west airstrip is still visible in the field between Greenville Technology Inc. and Monsanto. Images provided by Randy Hoying. Lansdowne Airport itself is an interesting piece of Greenville history. Joe O’Brien, a farmer, established a small airstrip on his family farm just east of Greenville (in the current Greenville Industrial Park hemmed in by Jaysville-St. Johns Road and State Route 571), and officially christened Lansdowne Airport, named for local aviation hero Zachary Lansdowne, on September 23, 1928. Joe never flew, but his daughter, Blanche, and her husband, John McEowen (who drove Post to lunch), who together ran the airport, both eventually became talented pilots. Joe leased the airport to the city of Greenville for $1 per year, thus giving the small town an official municipal airport. A Daily Advocate article from May 1934 reported the airport was approved for a $12,000 expansion set to begin that summer. In the late 1940s, Blanche supervised a project to clearly label the town’s name on top of a local building, as it was law at that time for a town’s name to be identifiable from the air to aid navigation. No record exists of which of our local buildings announced the town’s name to pilots and passengers. The outlines of the two criss-crossed runways at Lansdowne Airport are still visible from the air, though the airport itself is long gone. The access road that covers the location of one of the runways is appropriately named Lansdowne Avenue. 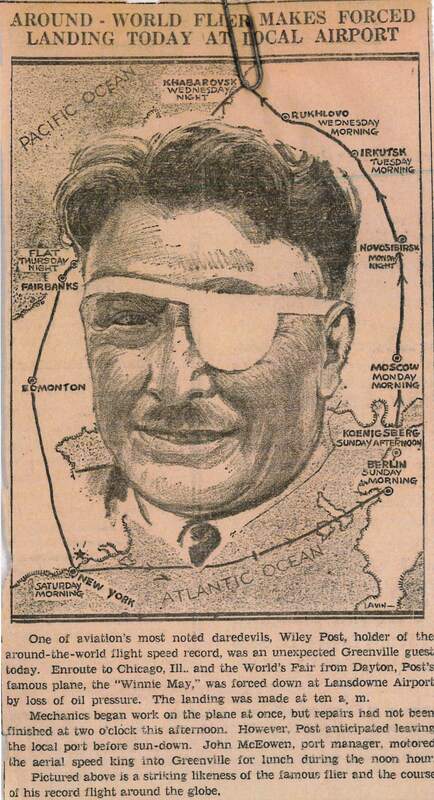 Sadly, Wiley Post’s life was cut short in 1935. He was trying to prove the viability of a mail and passenger flight plan between Alaska and Russia, and made several ill-advised modifications to the plane he intended to use for the surveying trip. Writer Will Rogers had convinced Post to take him with him to Alaska so he could write about the trip, and it was while the two men were trying to take off from a remote lake near Point Barrow in Alaska on August 15 that tragedy struck. Shortly after the plane lifted from the shallow water, the engine died, and the plane plummeted back to the surface of the lake. Post and Rogers were both killed instantly in the impact. With the disappearance of Amelia Earhart in 1937 and the diminished fame of Charles Lindbergh after he moved to Europe in 1936, the era of the celebrity pilot was drawing to a rapid close. The story of Post’s forced landing outside our small town doesn’t even warrant a footnote in the daredevil’s life story, and it seems to have earned little more than a quick mention from the Greenville press at the time. But looking back these 82 years, it’s neat to see even this small connection between our quiet town and the leaping advances taking place in the aviation world at that time. Less than 20 years after the nearby Wright brothers built the first powered airplane, pilots were crossing oceans and circling the world. One of those men ran into engine troubles and found a safe place to land in the fields outside Greenville. He ate lunch and took off, never to visit again. It’s a small connection our town had to the exciting things happening in the world that decade, but it’s fascinating none the less. I would like to thank Randy Hoying for supplying several photographs used in this article, and for the tip to the article in the Ocala Star-Banner. I would also like to thank Garst Museum and Carolyn Fisher in the Greenville Public Library Genealogy Department for searching (ultimately in vain) for information on Wiley Post’s landing in Greenville. If you have any information or photographs that relate to the topics in this article, please contact me at david (at) greenville-publiclibrary dot org. “Around World Flier Makes Forced Landing Today at Local Airport.” Daily Advocate (Greenville, Ohio), June 21, 1934. Mohler, Stanley R., and Bobby H. Johnson. 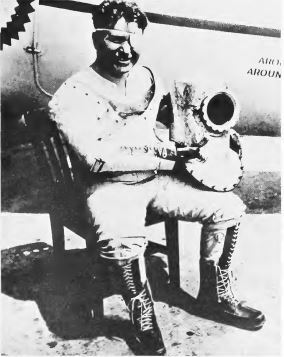 Wiley Post, His Winnie Mae, and the World’s First Pressure Suit. Washington, D.C.: Smithsonian Institution Press, 1971. Seiler, Toni T. “In Retrospect”: Greenville, Ohio. Arcanum, OH: Arcanum Copy Center, 1989. “Lady Pilot Remembers Her Solo, 60 Years Ago.”Ocala Star-Banner (Ocala, FL), August 4, 1999. https://news.google.com/newspapers?nid=1356&dat=19990804&id=G2lRAAAAIBAJ&sjid=tQgEAAAAIBAJ&pg=4401%2C3245166&hl=en.